Maybe you don't consider yourself a writer...but if you have a blog, you should! You use words to communicate; you write. 1. Both take lots of patience. 2. Often, in both marriage and writing, you have to go back and edit (apologize), revise, and change your ways! 4. They both go better with a team. In writing, critique partners make all the difference, and there’s nothing like a marriage where both partners share the load. 5. The more you pour into both, the more blessings you receive. 6. Both require good communication. Without that in writing, no one will get your message; in marriage, we can all recount a situation that resulted from communication gone awry! 7. Both thrive on constant attention. To be a writer, you have to write, write, write. 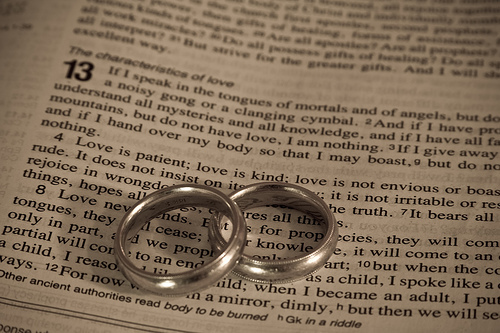 To maintain a marriage, you have to love, love, love – and love some more. 10. 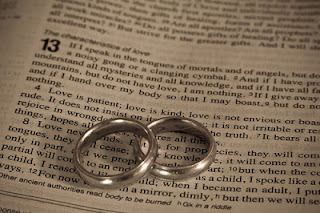 With both marriage and writing, if they’re God-given and inspired, there’s not much greater! Linking up today with Beth from Messy Marriage for Wedded Wednesday. Wow! I've not really thought of the similarities between these before and it's striking how similar they are! I love this, Laura Lee. I'm so glad you linked it with Wedded Wed. It's one of those really concise but deeply profound lists that really encourages and illumines. Thanks for your heart for marriage and especially for God!